This time we’ll focus on a healthy snack food which I recently discovered. Unlike many of the others I’ve reported on so far, it stands pretty well nutritionally on its own. Being in cookie form makes it easy nibble in the middle of work, in bed, or anytime the munchies strike. Another thing I like about this product is the manufacturer is focused exclusively on making sunflower seed based snacks, and only has five products to date. As soon as I pulled one of these cookies from the pack with my thumb and pointer finger, I was surprised by it’s tiny size and odd appearance – the manufacturer clearly favors substance over style. Popping it into my mouth, it’s firmness was another surprise, not quite tough enough to achieve ‘rock’ status, but definitely harder than I expected. 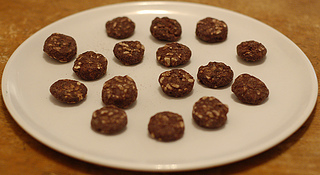 However after a few bite-sized chunks, I quickly got used to the crunchy texture and began enjoying the process of breaking each cookie into smaller and smaller fragments in my mouth. This is another product where the texture takes importance over the flavor. The flavor itself is quite mild, a mixture of chocolate and nuttiness well blended together, accompanied by a light sweetness. I wouldn’t say there is much of a sunflower seed taste, though as far as I remember sunflower seeds are more about the texture of the seed and saltiness than any particular taste that stands out. One serving of 14 pieces (30 g, or roughly 1/6th of a 6 ounce pack) contains 140 calories which is reasonable given how filling these little nuggets are. Sugar is also on the low side, with only 4 grams per serving. This is around half that in Justin’s Chocolate Hazelnut butter, which is already low in sugar. Sodium is also low at 140 mg (6% DV), and there is a good amount of fiber – 3 grams which translates to 12% of daily recommended value. There is a modest amount of protein as well, with 6 grams per serving. Sunflower seeds contain a wide variety of nutrients including amino acids, Vitamin E (10% DV), and cholesterol lowering phytosterols. They also are top rank in the nuts & seeds category, based on Whole Food’s ANDI score, which measures nutrient density (“Aggregate Nutrient Density Index”). In case you’re curious, sesame seeds are #2 which coincidentally are also present in these cookies. There are 13 ingredients, with the top five as follows: sunflower seeds, wheat flour, sugar, organic evaporated cane juice, and cocoa powder. A key point here is that sunflower seeds are #1 on the list – these are not something thrown in just to add a appearance of healthiness, they are the most prevalent ingredient. Cocoa as the fifth ingredient is also a nice bonus. My only major gripe is the presence of “natural flavors” in the ingredient list (as #11, but still). As mentioned in other reports, I am uncomfortable with this since I don’t know exactly what I am eating, only that it’s “natural”. It could be made from tree bark for all I know. I’ve sent a request to Somersaults Snack Company for more information about what “natural flavors” contains, will update this post when I receive a response. This ingredient does contain the text “(milk)” next to it, but It’s not clear if that means only milk is included or if milk is just one of the things used. The natural flavors in our Dutch Cocoa are: butter and brownie. So while there isn’t explicit butter or brownie ingredients inside the product, natural derivatives used to make these products can be found in Somersaults. These are available directly from the producer’s website in .5 oz , 2 oz, or 6 oz bags. The current prices for these are very reasonable at $0.71, $1.70, and $3.59, respectively. You can also buy in bulk for a discount. Supporting direct sale in a variety of sizes like this is pretty impressive, and the first time I’ve seen this for a product. 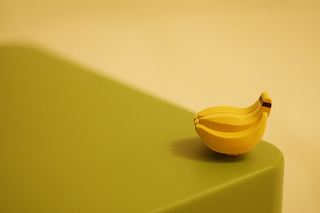 There is even an option on the site to sign up for recurring delivery and save an extra 10%! I purchased my 6 ounce bag from Whole Foods Market for around the same price as above. 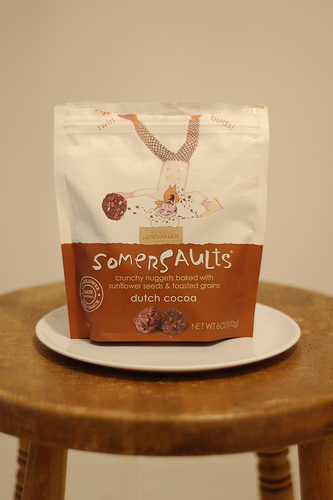 Dutch Cocoa Somersaults are a sunflower seed-based snack with a mild flavor and can fill you up pretty easily with their natural ingredients. Great for anytime you hunger for some nutrition but don’t have time for a proper meal.